The EPA’s ENERGY STAR© program has been labeling energy efficient products since 1993 and now is looking at roofing. Once again, roofs are being asked to do more than provide a setting for HVAC systems or outdoor patios. A new program by the Environmental Protection Agency (EPA) is looking at rating roofs for their reflective properties and the industry is gearing up for another debate about added benefits. The ancient technique of using light colors for roofs is going high-tech while manufacturers contemplate marketing a product with the most shine. Companies have been touting heat reflectance for years, but the recent government initiative may greatly enhance the market demand for roofing systems that do more than just protect the entire contents of a building. Studies are now looking at the dynamics of modern roofs while seeing how they can lower cooling bills, reduce heat in urban areas and maybe even save the world. 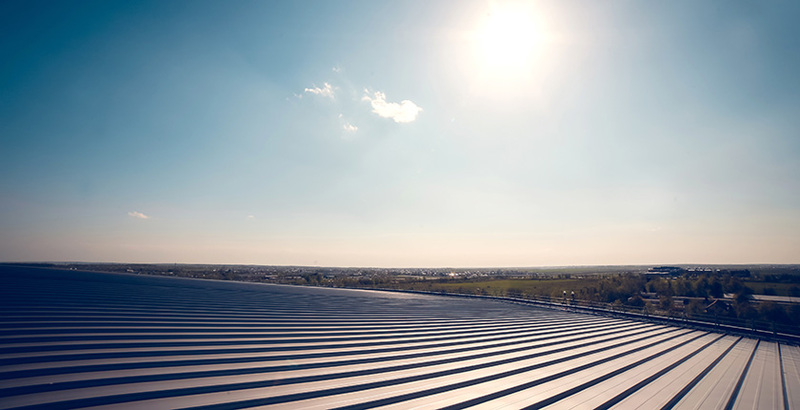 The potential energy savings are enormous for areas such as the Sunbelt, but much of the United States stands to benefit from a gleaming roof. Roofing contractors may soon find more customers ranking reflectivity a close third to durability and cost. The EPA’s ENERGY STAR program has been labeling energy efficient products since 1993 and now is looking at roofing. More than just the reflectivity, the ENERGY STAR program considers a variety of environmental factors when rating its products. And there is a growing interest in the roofing industry. “If the building has air conditioning, there are energy saving benefits in lighter roofs,” said Dr. Hasem Akbari, leader of the Heat Island Group at the Lawrence Berkeley National Laboratory in Berkeley, Calif. For fifteen years, Dr. Akbari has been studying the reflectivity of building materials at this Department of Energy-funded lab and has calculated the reflectivity of several roof surfaces. According to the Solar Reflective Index (SRI), a new rating system developed by the National Lab, the SRI of materials range dramatically, from one for a black EPDM to 85 for a white. Roofing materials from green asphalt shingles (19) to new galvanized steel (46) to white coatings (73) may one day be rated according to reflectivity, just as they are for fire, wind, and hail. There are many details to be worked out and the Cool Roof Rating Council (CRRC) is meeting this month in San Francisco to tackle some of those details. This ad hoc committee of roofing manufacturers, government agencies, utilities, and other researchers is the outgrowth of past studies and initiatives about the reflective properties of lighter colors on roofs. While most any roof can benefit, the coatings segment is becoming strong boosters. Metal roofing is highly reflective as well, and that segment is getting on the bandwagon. Bethlehem Steel has already produced a chart that shows the heat transmission of roofs made form its Zincalume is less than galvanized or terra cotta surfaces. BIEC International, a licensing organization for Galvalume, met last month in San Antonio, Tex., and the reflectivity issues [sic] was on the agenda. “We see great potential,” said Richard Ley, coating technologist for BIEC. “We feel that the metal roofs have pretty good reflectivity compared to other roofing materials.” It is not as though Galvalume needs help. Ley reported a 25 percent growth in 1997 for the twenty-five-year-old product. However, the reflectivity of metal may be tempered by its low emissivity, which means it absorbs some of the radiant energy that other materials reflect. But the energy-saving debate is much larger than that, involving diverse issues such as landfill space, manufacturing emissions, number of trees, and even recycling. Ley feels that any ground lost on the reflectivity front can be made up elsewhere; he points out that longevity in roofing saves money and resources. Also, the industry is fond of touting that steel has been recycled decades before it was fashionable. Another wrinkle in this reflectivity issue is to whom does it appeal? Much of the interest appears to be in the commercial segment, although some observers think the residential market could be enormous. But where? There is the lingering perception that reflectivity is a regional solution mainly for the South and West. “Reflectivity reduces solar load but don’t you want a solar load in Chicago in January?” asked Helens Hardy Pierce, director of technical services/commercial roofing for Tambo Joplin, Mo. “Yes, in some climates there is a benefit to ‘cool’ roofing material.” Pierce serves as secret try for the CIRC. and her interest in the group is seeing if products not particularly famous for their reflectivity — such as asphalt shingles and mineral cap sheets have a market in all this. A report by Green Seal, a non-profit organization in Washington, D.C., has a chart showing that the reflectance of asphalt shingles can be increased 15 to 30 percent using “premium” white granules at a negligible cost. Granule suppliers are reportedly working on material that may increase the reflectance of shingles by 50 percent. Green Seal, which also rates environmentally friendly products, factors lifespan and fire ratings into its roofing reflectivity report; the report suggests that homeowners should look for a twenty-year roof. The idea is to get people thinking about reducing and reusing, and that includes energy and materials. Green marketing still has strong appeal among consumers and the reflectivity issue might be the breakthrough. After all, global warming is a (ahem) hot topic. Besides the money saved by building owners, utilities may soon be getting involved in roofing for the first time, offering owners rebates for “reflective roofing” just as they offer them for energy-efficient appliances and extra insulation. Also, code bodies are showing an interest in reflectivity, and there is nothing like a mandate to kick things into gear. For years, scientists have been studying a phenomenon called urban heat islands, where the sun’s energy, that is not reflected by buildings or pavements or absorbed by vegetation, raises the temperatures of our cities. Cool Communities is designed to mitigate that heat build-up by concentrating on roofs, pavements, and trees. But consider this: Doesn’t every city have its “Darth Vader” building, one with dark tinted windows! Isn’t that energy efficient? And some have complained that when all the buildings have mirrored windows, people walking around them can feel like ants under a magnifying glass. So as we try to resolve this reflectivity concept, the sun tries to remain color blind. For the decisions this industry makes about saving energy on the roof are not going to be black and white. Want to learn more about the impact our ENERGY STAR qualified roofing products can have on your facility and your bottom line? Can Roof Coatings Save Your Next Roof?